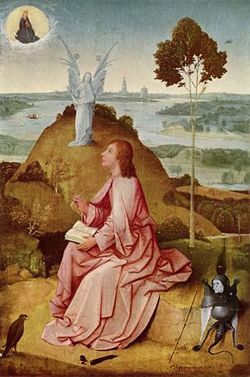 The evangelist John of Patmos writes the Book of Revelation. Painting by Hieronymus Bosch (1505). According to the Book of Revelation, Armageddon (from Har Megido (הר מגידו) Hebrew: meaning "Mountain of Megiddo"), refers to a cataclysmic battle between God and Satan that will allegedly occur during the end times. The actual hill of Har Megido, located in the State of Israel, was the location of many historical battles in antiquity. In a general sense, the term can also refer to any major apocalyptic catastrophe. The New Testament suggests that during the battle, Satan will operate through the person known as the "Beast" or the Antichrist, whose forces will ultimately be defeated by God. 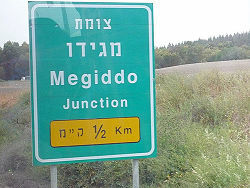 Street sign in modern Israel indicates exit to Har Megiddo. The alleged site of Armageddon is located on a small elevated plateau in the modern state of Israel close to a level coastal plain large enough to accommodate many thousands of troops. Historically, gatherings of armies such as the Assyrians, Chaldeans and later the Romans occurred at Megiddo as a staging ground or assembly area for subsequent deployments toward the fortified garrisons uphill from the coast. The Books of Kings and Books of Chronicles describe a battle that took place at Har Meggido in 609 B.C.E. This battle resulted in the death of Josiah, whose quick and untimely demise precipitated the decline of the dynasty of King David, and may have inspired stories of the return of a Messiah from this lineage. Josiah had used the terrain to mask his approach as he attempted to ambush the Egyptians who were on their way to attack the Chaldeans. The valley is marked by the presence of the archaeological mound (tell) representing the accumulated ruins of Bronze Age and Iron Age settlements that flourished between 5000 years ago and 650 B.C.E. "It has been held commonly that the battle of Armageddon is an isolated event transpiring just prior to the second advent of Christ to the earth. The extent of this great movement in which God deals with “the kings of the earth and of the whole world” (Rev. 16:14) will not be seen unless it is realized that the “battle of that great day of God Almighty” (Rev. 16:14) is not an isolated battle, but rather a campaign that extends over the last half of the tribulation period. The Greek word "polemo," translated “battle” in Revelation 16:14, signifies a war or campaign, while "machē" signifies a battle, and sometimes even single combat. This distinction is observed by Richard Chenevix Trench in his New Testament Synonyms, and is followed by Joseph Henry Thayer in his Greek-English Lexicon of the New Testament and Marvin R. Vincent, in his Word Studies in the New Testament. The use of the word polemos (campaign) in Revelation 16:14 would signify that the events that culminate in the gathering at Armageddon at the second advent are viewed by God as one connected campaign." However, the Preterist interpretation is that the seventh bowl of wrath mentioned in Revelation 16:17-21 refers to events culminating in the historical destruction of Jerusalem in 70 C.E. The Islamic Prophet Muhammad has prophesied about several events that will occur just before the advent of the Day of Judgment (Qiyamah). Among these, Muhammad has foretold the return of Jesus (Isa in Arabic), who will materialize when a false claimant to divinity (the Dajjal) will attempt to misguide humanity into worshiping him. Jesus will descend from the heavens in Damascus, pursue and kill the Dajjal, destroy the savage and unbelieving armies of Gog and Magog and bring peace and brotherhood to the world. Christians will recognize the truth and accept him only as a Messenger of God, the religion of God (Islam) will justly rule the world. There will be no oppression and no need to fight oppressors (war will be abolished) and no need to collect Jizyah (since there will be no non-Muslim to collect this tax from). Every human being will be well-off and no one will accept charity. Jesus will perform Hajj (pilgrimage), marry, remain married for 19 years, beget children, and die after living on earth for 40 years. His death will signal the beginning of the last days. First, they believe that a series of tablets were written by Bahá'u'lláh, the founder of the Bahá'í Faith, and sent to various kings and rulers. Second, during [World War I]], the real, actual Battle of Megiddo (1918) is seen by Baha'is as a literal fulfillment of the prophecy wherein World Powers were in battle. Specifically, General Allenby's victory at Megiddo, which prevented the Ottoman Empire from crucifying `Abdu'l-Bahá, then the head of the Bahá'í Faith, is viewed by Bahá'ís as having been the literal Battle of Megiddo. The third interpretation reviews the whole progress of the World Wars (though these can be viewed as one process in two phases), and their derangement of the means and norms of the world before and after. The Witnesses believe that this war is not one of nations fighting against one another with nuclear, biological, or other weapons of mass destruction, since it says that the kings of the Earth "gather together" against Christ. Moreover, they suggest that there is no way that all of the armies of the world could gather around the relatively small area that is Megiddo in modern-day Israel. Instead, Revelation 16:16 calls Har-Mageddon (Mountain of Megiddo) (mountain of the assembly of troops), "the place" where these kings are gathered for this final showdown. They feel the Bible uses Megiddo as the "symbolic" place of gathering of all the kings of the Earth, where they will try to do battle against God and his forces. This action on the part of the kings of the Earth is provoked by expressions and signs inspired by demons. Jehovah's Witnesses believe the collective action to persecute God's chosen people on earth is what finally triggers this war. Ezekiel 38 prophesies that Gog, king of Magog will collect an army of many nations to attack God's people, believing them to be vulnerable and unprotected. God responds by causing them to fall one against another's swords; he strikes them with pestilence, floods, hailstones, fire and sulphur. The chapter ends with God declaring that the nations "will have to know that I am Jehovah." Armageddon is followed by the establishment of God's kingdom over the earth—a period commonly referred to as "Christ's Millennial Reign," when "Satan is bound for a thousand years" (See Rev. 20:1,2). The final judgment and purification of the earth's sin occurs at the end of the Millennium, when Satan is "loosed for a little season" (Rev. 20:3, 7-9) and allowed to "go out to deceive the nations … and gather them to battle" against "the camp of the saints and the beloved city." When Satan loses this battle he is finally cast into the "lake of fire and brimstone" (representing complete, eternal destruction, Rev 20:14). Those who join him in this battle will, likewise, be eternally destroyed. The Jehovah's Witnesses believe a prelude to Armageddon will be the attack on all religions by the Prominent World Powers. According to the Rastafari movement, it is Haile Selassie who appears in the Book of Revelation. Armageddon (or rather "Amagideon") is a slightly different theological concept, meaning not so much a specific battle, but rather the general state the entire world is in now, which has been getting progressively worse since 1930, and especially since 1974. However, Selassie's role in the Second Italo-Ethiopian War is in many ways seen as a fulfillment of some prophecies. Seventh-day Adventists believe that the terms "Armageddon," "Day of the Lord" and "The Second Coming of Christ" all describe the same event. They teach that the Apostle John borrowed what was local and literal in the Old Testament and gave it a global and spiritual application in the New Testament. The historical event John borrowed to explain Armageddon is Cyrus the Great's conquest of Babylon. The historical Cyrus came from the East, dried up the river Euphrates to conquer Babylon and thus enabled the Jewish people to return from exile. King Cyrus represents Christ, Israel represents spiritual Israel (God's commandment keeping church) and Babylon becomes an end-time spiritual coalition. The water of the river Euphrates represents "peoples, and multitudes, and nations, and tongues" (Revelation 17:15) or the inhabitants of the entire earth. The "three unclean spirits" represents the method used to persuade the earth's inhabitants ("miracle working") and is countered by the messages of the three angels of Revelation 14. Seventh-day Adventists further teach that the current religious movements taking place in the world are setting the stage for Armageddon. They believe that the end-time spiritual coalition will threaten religious liberty, and are particularly concerned about the growing unity between spiritualism, American Protestantism and Roman Catholicism. A further significant difference in Seventh-day Adventist theology is their teaching that the events of Armageddon will leave the earth desolate for the duration of the millennium. They teach that the righteous will be taken to heaven while the rest of humanity will be destroyed, leaving Satan with no one to tempt and effectively "bound" (Revelation 20:1). The final re-creation of a "new heaven and a new earth" (Revelation 21:1) then follows the millennium. ↑ 2 Kings 23:28-30 and 2 Chronicles 35:20-25. ↑ J. Dwight Pentecost. Things to Come. (Grand Rapids, MI: Zondervan Publishing House, 2003. ISBN 0310308909), 340. ↑ However, one indication that the book predicts a future event is the mention of an army from the east of 200 million, a number that would not have been possible in any battle of that period. ↑ Stephen Lambden, "Catastrophe, Armageddon and Millennium: some aspects of the Bábí-Bahá'í exegesis of apocalyptic symbolism." Bahá'í Studies Review 9 . Retrieved October 19, 2008. ↑ Revelation—Its Grand Climax at Hand! (Watch Tower Bible and Tract Society of Pennsylvania), 279-280. ↑ Watchtower, 9/15/2005, 19. "Walk by Faith, Not by Sight!” (Watch Tower Bible and Tract Society of Pennsylvania.) "Bible prophecy indicates that militarized powers within the United Nations will see religion as a disturbing element and will act to destroy modern-day Jerusalem—Christendom—as well as the rest of Babylon the Great. (Revelation 17:12-17) Yes, the entire world empire of false religion stands on the brink of destruction." Seventh-day Adventists Believe … A Biblical Exposition of 27 Fundamental Doctrines. (original 1872) 1988.Ministerial Association General Conference of Seventh-day Adventists. . Retrieved November 9, 2008. Watchtower 12/1/2005, "Armageddon—A Happy Beginning." Watch Tower Bible and Tract Society of Pennsylvania. Watchtower 6/1/1996, “Flight to Safety Before the “Great Tribulation.”” Watch Tower Bible and Tract Society of Pennsylvania. Watchtower 9/15/2005, "Walk by Faith, Not by Sight!” Watch Tower Bible and Tract Society of Pennsylvania.